Some exciting news for you today! We are CASE-ing (Copy & Selectively Edit) the ah-mazing JAY SORIANO, who is also joining us on this hop! Exciting! I hope you find great inspiration from all the projects in this hop. You may be starting the hop here at my blog (Jessie Holton) or you may have come from the previous person on the list. Be sure to click on the next person in the list to continue your blog hop adventure casing Jay's work. Here's Jay's card which I have chosen to case. I really love how this sentiment panel pops against the diagonal one behind it. I love that Jay has used black for the panel, too. It's really bold. And here is my take on it. I have used the Naturally Eclectic Designer Series Paper (DSP) with a strip of Black Shimmer Ribbon & coordinating cardstock in Lemon Lime Twist, Emerald Envy, Berry Burst & Fresh Fig. I have cut a circle of Basic Black cardstock using the Stitched Shapes Dies. I have then layered the Silver Foil with the Hugs circle die from the Lovely Words Dies with a slightly larger circle from the Layering Circle Dies & put them through the Big Shot at the same time. I have used both portions of the Hugs Die cuts so I get two sentiments from each die cut. I used the new Adhesive Sheet on the back of the Silver Foil before I cut it & it made life soooo much easier just having to peel away the backing & stick the dies onto the black circles. And I didn't get any glue on the front of the Silver Foil! Hooray! I found the Precision Plate made it easier to I've added a bit of Silver Metallic Thread & the Metallic Sequins Assortment for a bit of bling. My sentiments are propped up on Dimensionals. 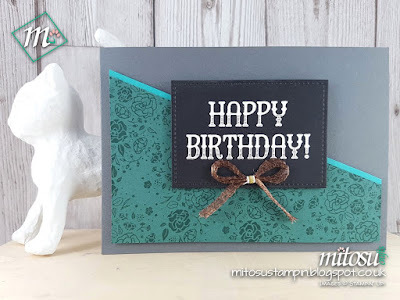 On the inside of this card, I have used one of the sentiments from the Big on Birthdays stamp set & I have inked it up in Lemon Lime Twist all over, then 2/3 Emerald Envy & 1/3 Night of Navy. This is a fun Ombre technique for lazybones like me haha! When using this technique, it's important to start with the lightest colour & work your way to the darkest one. You also want to use colours that would naturally & easily blend into each other. To see this technique in action, you can watch my Facebook Video here. I hope you have enjoyed my cards today & that you can hop around the rest of the crew & enjoy our cases on Jay's work. Thanks for joining us Jay, you were a lot of fun to case!